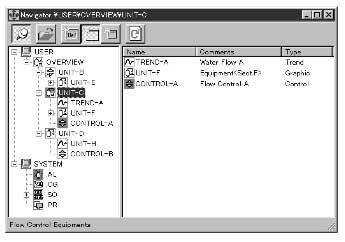 We have developed a software package called Human Interface Software (HIS) for Yokogawa's medium-scale DCS, CENTUM CS 1000. The HIS application was developed on Windows NT and includes both the man-machine interface (MMI) function of conventional DCSs and the user-friendly operation of Windows software. This paper gives an overview of the HIS application and describes its features in regard to the Windows-based operation, hierarchy of windows and open data interfaces. Moreover, this paper introduces the basic configuration of processes/threads, several methods for achieving high speed drawing, and how we have made CENTUM CS 1000 more adaptable to the global market. Windows, Windows NT, Excel, OLE, DCOM and ActiveX are registered trademarks of Microsoft Corporation. The range of work covered by an operator has expanded to include not only operation and monitoring but information handling as well. This in turn has increased the need for dedicated human-machine interface software to run on Windows*2-based operating systems, that offer increased networking capabilities and a wide choice of general-purpose applications. The advancements in the performance of personal computers and the increased functionality offered by Windows-based operating systems have led end users to increasingly demand these technologies in their systems. In response to these changes, we designed the HIS so that the operation and monitoring functions can be integrated in a more open environment. The HIS is designed to run on a general-purpose PC/AT- compatible personal computer. The operating environment of this software requires the CPU to be a Pentium/166 MHz or superior with a memory of at least 64 MB. Since this software can be run on a general-purpose personal computer, users can take advantage of the better cost performance offered by the latest PC models. Users can also use such peripherals as printers supported by Windows NT*2. This provides the user with a wider choice of peripherals and the freedom of selecting equipment that meets their needs in any part of the world. 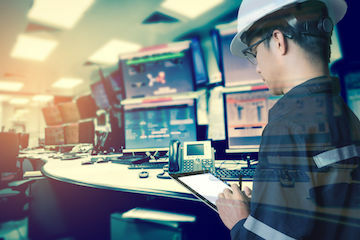 Alternatively, users who are more concerned with system reliability can opt for the Yokogawa-made personal computer that offers an RAS function—Reliability, Accessibility and Serviceability—for monitoring temperature and fan motors. The HIS uses Microsoft Windows NT 4.0 as the operating system, and is designed to operate under Windows NT as one of software packages. Some HIS functions such as the report package, are run on Microsoft Excel*2. CENTUM CS 1000 uses a VLnet as the control bus. The use of the VLnet means that the PCI-standard communication module and dedicated driver can also be used. In addition to the Yokogawa-original control bus communication protocol, CENTUM CS 1000 also allows for TCP/IP communication, as well as regular communication between operation and monitoring stations. An optional dedicated keyboard, which increases the efficiency of operation and monitoring, is also available. The HIS offers two types of window configuration: the window mode and the full-screen mode; either of which can be selected by the user depending on their application needs. In the window mode (see Figure 1), most windows open in the standard overlapping manner, providing an operating environment that looks and feels the same as other general Windows-based software. In the full-screen mode (see Figure 2), main windows open to the full width of the screen. Thus, this mode provides basically the same window views as presented by the operation and monitoring functions of a conventional DCS. In both modes, the HIS opens the System Message window in the topmost section of the screen. 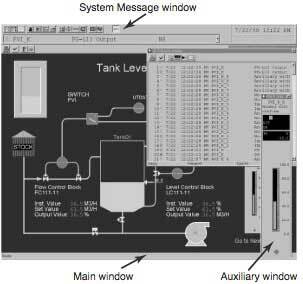 The System Message window contains a number of buttons for opening different types of windows and some of the latest versions of process alarm messages as well. To prevent the operator from accidentally missing any active alarms, the System Message window is designed to open as an application bar, which is identical to the task bar of Windows NT Explorer. This means that it is always visible – never hidden under any other windows during normal operation. maintenance windows used to maintain the system. Dialog boxes are shown in addition to these windows. 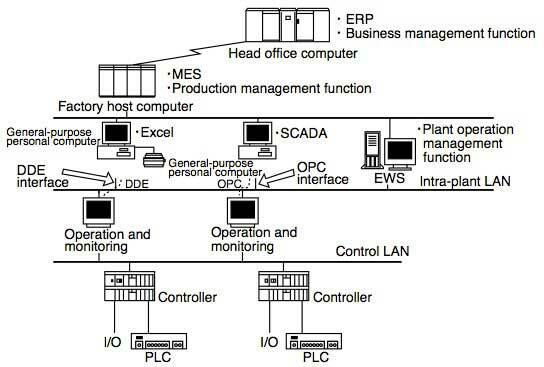 The operation and monitoring windows of the HIS are systematized according to a window hierarchy, which integrates these windows in a layered structure. 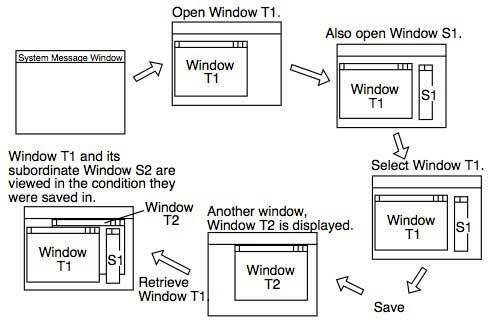 Figure 3 is an example of the window hierarchy. This layered structure allows users to effectively perform such functions as moving through windows and alarm monitoring in a "top-down" manner. More specifically, users can collectively monitor the alarm statuses of all tags in the lower-order graphic window, at one time in the topmost graphic window. 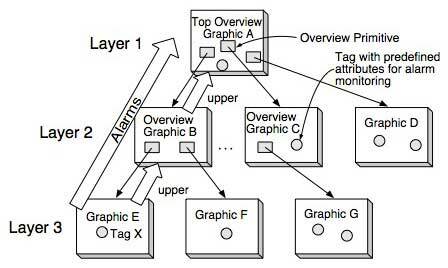 Figure 4 illustrates how alarms are monitored in a hierarchical way. 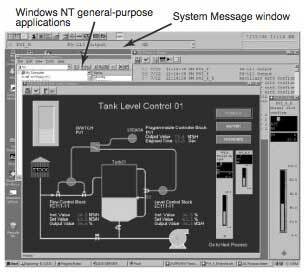 In normal system operation, this approach enables the operator to view the operating status of the entire plant by a single look at the highest-order window or the Windows NT general‑purpose System Message window. A dedicated Navigator window that provides an easy-to-understand view of the layered operation and monitoring windows, is also available. In addition to this direct access function, the Navigator window also presents a "bird's-eye view" of the alarm statuses in all windows by showing icons that represent them. Figure 5 shows an example of the Navigator window. The HIS is designed to allow the operator to access and run general-purpose Windows applications while working with operation and monitoring windows. 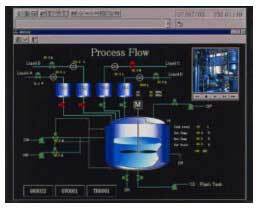 For example, users can show multimedia guidance messages to control plant equipment or manage data on plant operation using general-purpose software such as Excel. In such a case, the HIS regards the operation and monitoring windows and the general-purpose applications as separate groups of tools, allowing the operator to alternate between these groups using the Circulate button in the System Message window or on the dedicated keyboard. This eliminates the risk of losing any necessary operation and monitoring window in the event of an emergency. The HIS provides a function called the dynamic window set which allows the operator to save the current display of open windows in a dynamic manner. This means that the operator can restore the states of these windows later with just one touch. The function also enables the operator to define a window set without having to do any preliminary engineering work. 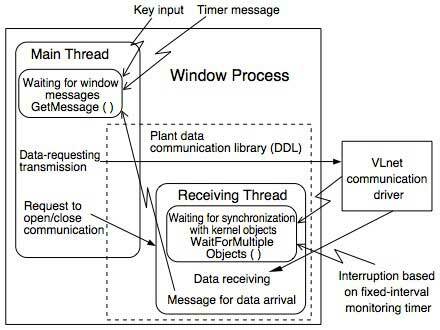 Figure 6 illustrates how the dynamic window set works. The open data interface provides users with access to the following HIS-owned process data items from a wide variety of applications. 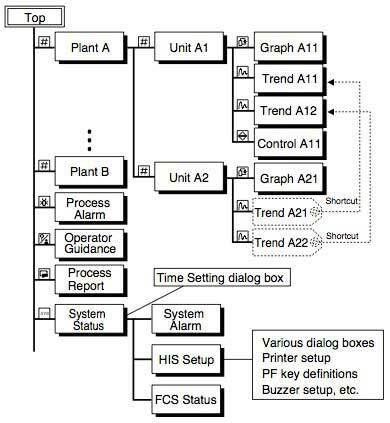 Figure 7 shows a system configuration when the open data interface is used. The following two interfaces are available. OPC is an interface specification designed to enable Microsoft's OLE and DCOM*2 technologies to handle process data. OPC is currently being standardized on a global scale. In the system environment offered by the HIS, users can access process data through an OPC interface using Visual Basic or alternative means. The HIS is designed so that process data can be updated in one second in any of the operation and monitoring windows. Generally speaking, Windows NT involves a larger performance loss-consumes more CPU time-in process-to-process switching, compared to UNIX. For this reason, major server functions have been developed, such as the dynamic link library (DLL), to minimize the frequency of process-to-process communication (see Figure 8). It has also been found that an increase in the frequency of communication with field controllers leads to an increase in the VLnet's load. To solve this problem, we extracted software components from the required system specifications in such a manner that the rounds of communication arising from a particular process are integrated into one so that communication traffic with field controllers is minimized. Normally, operation and monitoring software is created as event-driven software. In Windows NT, two types of events exist simultaneously, however—a wait for window messages and a wait for synchronization with kernel objects. This presents a problem due to the fact that the operation and monitoring software cannot wait for both of these two events at the same time. To solve this problem, the multi-thread function is used to convert one event into the other so that only one type of event is waited for in the main thread. As standard, sound is used to signal plant failures to the operator. In addition to sound however, the HIS also directs the operator's visual attention to on-screen buttons and other window elements by making them blink. Since Windows does not support this blinking function as a standard feature, the System Message window of the HIS is designed to rewrite the hardware palette at a fixed interval using the palette animation function. 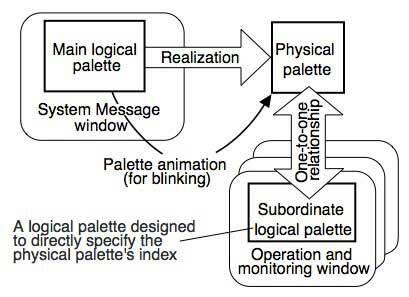 Other operation and monitoring windows also use the logical palette that directly refers to the hardware palette. These design features have helped realize a high-performance blinking function that does not require frequent redrawing or impose any extra load on the CPU. Figure 9 illustrates how the blinking function is realized. The use of a general-purpose personal computer usually means that the combinations of display units and graphics boards vary widely from user to user. Windows that appear on the display unit, therefore, must be able to support more than one type of diplay resolution. In the case of the HIS, all windows allow users to change the font and/or re-scale the windows. In addition to this scaling function, the HIS provides fixed large- and medium-size windows to reduce the burden of operators. The dedicated graphics engine has been developed for graphic windows. In addition, an extended WMF (Windows Metafile) has been employed, as part of the format of graphic object files, in order to achieve high-speed drawing in these windows. Other enhancements have been made by adding new functions, such as the incorporation of bit maps or photographs from external sources, to the functions of conventional graphics engines. These enhancements have reduced the amount of labor required to create graphic elements. Figure 10 shows an example of a graphic window. CENTUM CS 1000 has been developed with the international market in mind. Localization of the system according to the needs in the country in which it is installed is required in many different specifications, including the types of messages and the time format. To meet these requirements, all of the messages used by the HIS internally have been formed into an external file, called the resource DLL. This approach makes it possible to localize CENTUM CS 1000 simply by rewriting the file using local language. In this paper, we have given an overview and described the features of the HIS function. The HIS is not just an operation and monitoring software package that runs under Windows NT; it is a software package loaded with the latest technologies. Such technologies include the ability to work in harmony with general- purpose applications and work as an open data interface, which will serve as Yokogawa Electric's main human-machine interface for DCSs in the future. We hope to further enhance the HIS function by adding batch control software packages or making ActiveX*2 controls available in the HIS, as well as by making the plant control system even more open.